It is the immaculate spot for loads of entertainment and a heap of bonuses. Virgin is a company owned by Richard Branson and a well-known name throughout the online gaming industry with a reputation of integrity players can rely on. Virgin Bingo launched in May 2009 and the cream rose to the top in a remarkable short time as a leading site in the UK. Under the Virtue Fusion software the site switched to Gamesys in January, 2013 with a brand new platform of products. Carrying over existing players and capturing the attention of new players with a magnificent library of games including a stellar Bingo games and Slot selection and packed with powerful promotional offers spells success no matter how you look at it. Virgin Bingo previously licensed in Alderney is now licensed by the Government of Gibraltar and regulated by the Gibraltar Gambling Commissioner. Delivering more of what players want with more games than ever before. The portfolio includes not only a division for Bingo but a full Casino that is accessible and launched through the homepage for a one stop destination of complete entertainment. There are three Bingo rooms one for 90 ball bingo, one 75 ball bingo and for those players looking for lollapalooza Jackpots try the Adventure 90 bingo room. The chat community is your Bingo lingo for social gathering while you let the automatic dauber do your entire card dabbing for you. Other games certain to grab your attention include Instant Games, Slots, Table Games and Video Poker. For endless entertainment that is certain to toggle at the gambler’s heart strings with adrenaline rushing action you can’t really go wrong hanging your hat at this site. If Free Bingo grabs your attention you’ll find plenty here. Every week they are giving away fantastic prizes and unlike other Free Bingo rooms players can chat away with roomies during these sessions. Like a bit more bingo for your buck? BOGOF is available every day in the Enterprise 90 room where you can buy one card and get another one absolutely Free. Your first deposit will sky rocket with a sweet Bonus that will cha-ching your credits and welcome all new players. Whether you are playing Bingo or Casino games it pays to play because win or lose you will earn valuable V-Points. You’ll have two options for redemption including real cash or use towards the Virgin Flying Club Miles. The cream rises to the top with one of the most extensive gaming venues in the online bingo industry. 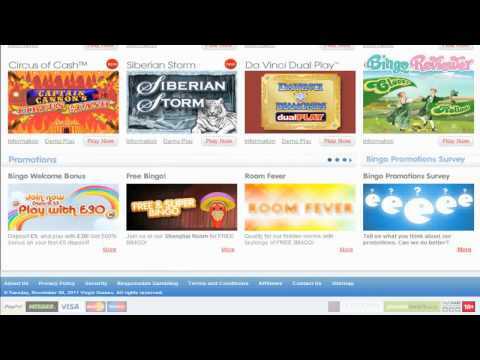 The success with sister brands like Jackpotjoy and Sun Bingo places this site under umbrella that is destined for greatness. We rate Virgin Bingo with 4.5 Pink Hearts. I think Virgin Bingo's biggest draw is the fact that they have lots of tie-ups with other Branson companies. Imagine you can earn V points on the site and use it for air miles and other stuff! My mother introduced me to Virgin, and that would say a lot about the site's easy navigation and use. I am still teach my mom how to send SMS messages on her cellphone and she's had her Nokia for like more than a year. But she was able to figure out the site. I liken it to a good rewards credit card. The more you use it the more rewards you get. Virgin really shows the way in making you feel pampered. Imagine that you earn points just by being on the site and playing to your heart's delight. And the bonuses are nothing scoff at! I was attracted to try Virgin bingo because of their low minimum deposit. Not only that, they also match your deposits until 100 quids. But the bonuses are not all, they have really good games, and by that I mean bingo games and side games. I go to Virgin for the 90-ball bingo and their side games. Check out Keno, it's very addictive! Virgin Bingo is one of my favorites sites. They have a ton of bingo rooms and network rooms. It is a bingo and casino site all rolled into one so you get the best of both virtual worlds. I like the Velocity Rewards program and unlocking the next level of for greater benefits. On my birthday i received an email with a birthday bonus and was a very nice surprise. Customer Service is great and i am impressed with the withdrawal process which i got paid in three days max. Yes you will feel like a virgin kissed for the very first time when you play here! New customers at Virgin Bingo are welcomed with a hefty £50 welcome Bonus, which is pretty nice compared to the smaller bonuses being offered at other sites. They are also letting everyone know that they are giving away cash prizes this week even if you don't win in their daily 1 TG Woe games between 8 and 9pm. It's always nice to win something when you don't bingo. Featuring not only Bingo rooms, but Slots, Jackpots, Scratchcards, Instant Win Games, Roulette, video poker, Keno and Blackjack, it's easy to find your favorite entertainment and to let the winning commence. I like that you can click on and get information about the games easily and that you can also demo play the games to make sure they are right for your playing expericience. Some of the games are Virgin only, and some are networked in rooms with players from other places. the Velocity Rewards programs, V*Points, Red Room, and Birthday bonuses in the Velocity rewards program offer some of the fastest and most profitable bonus promotions in the industry. Have fun playing at Virgin Bingo, and be sure to take advantage of their mobile features so you can play on the go. Here's wishing you the best of luck at this site! I love this site mostly because of the free bingo they offer. It’s a really great deal and it’s not something you’ll very likely see anywhere else. Players can enjoy free bingo every morning in the Veebie room! In order to qualify, you must play through £1 worth of cash on bingo tickets, and the Veebie room will automatically open for you the following day from 11am to 12pm. Plus, they offer opportunities in the V room where free bingo is up for grabs every day at 6pm. The spectacular promotions don’t stop there either. When you can’t get it for Free, you can get if for seriously cheap. On Monday nights, you’ll find an array of penny games in the Marrakesh room. This is one site that will be difficult to beat when it comes to fresh, unique and downright unbelievable promotions and offers. I would definitely recommend this site to others! Nor sure if it is the best known company in the UK, but Virgin surely must be among the top 5. So, it is not a wonder they have such a huge community and one of the best looking sites I have seen so far. The site is very elegant and simple, in black and red colors, and with world famous Virgin logo all over. As they use Gamesys licenced software, you will find original games, which are among the best out there, great performance event without additional downloads, and you get all the newest games almost as soon as they are announced. The Bingo offer is not that huge, and there are only 75 and 90 ball games, and only three rooms available: Enterprise, Adventure and Voyage. Add the Casino games and Slots for a truly immersive gaming experience. For every £5 you spend on Bingo or £20 you spend on Slots or Casino, you get 1 V*Point that you can later exchange for cash of FF Miles! I really like the layout here. It is crisp and clean and executed very smoothly. They have two types of bingo to choose from when you play here, including 75 and 90 ball. I would have liked to see a little more when it came to bingo options here, but I was definitely pleased with their jackpots so that made up for the lack of options. You can get tickets for as little as 1p as well! I was extremely excited about the slot games here. They have tons to choose from and you can view a demo version of every single one before you waste any of your pennies on them. One of my favorite slots to play here is the Cleopatra game. In addition to slots and bingo, they also have a number of casino games to choose from including classics such as roulette, poker and more.